Directed by Brad Bird. Produced by Brad Bird, Damon Lindelof, and Jeffrey Chernov. Written by Damon Lindelof and Brad Bird. Release date: May 22, 2015. Despite often feeling more like a lecture than anything else, Brad Bird's Tomorrowland does nonetheless still entertain. It's often incredibly problematic, but it sweeps you up in its visuals and world-building, even if it's more likely to leave you wanting more of the futuristic world of the title than you'd hope going in. Yes, Tomorrowland is a wonder to behold, but we only get to see glimpses of it. Hopefully, at some point in the future, we'll get a film that more thoroughly explores it. The movie, meanwhile, sees an optimistic teenager, Casey (Britt Robertson), hand-picked by an A.I., Athena (Raffey Cassidy), to help save planet Earth. With the help of a man who had given up all hope, Frank (George Clooney), they will head to Tomorrowland, a futuristic city located in a different dimension that the world's best and brightest created centuries earlier, in hopes of stopping the seemingly inevitable demise. Yes, you read that right; Tomorrowland is located in a different dimension, has a ton of futuristic technology, and we only get to see it in all its glory for maybe ten minutes - and that might be generous. Oh, and it's run by a character played by Hugh Laurie, which is all kinds of awesome. 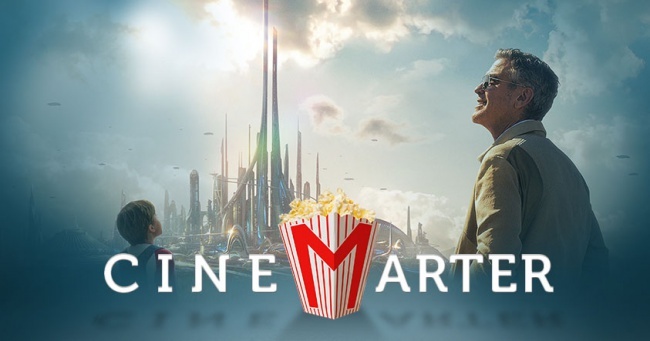 Most of the film, instead, takes place on Earth, as our characters try to figure out how to actually get to Tomorrowland, all while being chased down by evil A.I. who don't want them to achieve this goal. Why? It's ultimately irrelevant. We need a villain. Eventually, another villain is introduced simply so that he can deliver dialogue directly to the camera concerning the way we're destroying our planet - and despite all the warnings we've been given, we're not doing anything to fix that fact. Yes, it's that kind of movie. It's the preachiness that drags Tomorrowland down. When it's about these characters being chased, or even about trying to save the world through positive and creative thinking - no, really - it actually works quite well. Many of the Earth scenes function like a kid-friendly version of The Terminator, and that's swell. There's even a Rock 'Em Sock 'Em Robot fight thrown in! But then the message has to come to the forefront, not content to simply exist, noticeable but in the background. The film wants to make a point. It sacrifices fun to lecture the audience, many of whom will be children - this is a Disney movie, after all.